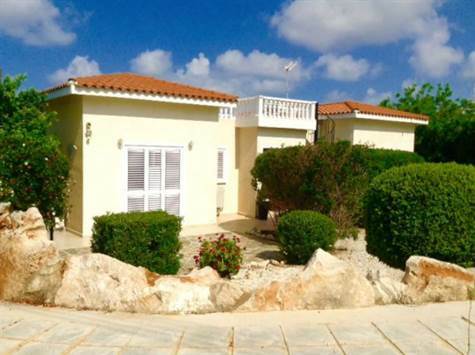 Sea Caves, Paphos, Cyprus - This well maintained 3 bedroom detached bungalow is situated in a quiet residential neighborhood on a private corner plot in the lovely Sea Caves area. The area is one of the most beautiful with some of the best beaches a few minutes drive away such as Agios Georgios, Coral Bay and the Akamas Pennisula. There are plenty of local amenities nearby, including a large variety of restaurants and cafes. The property features a spacious central living room with a comfortable lounge and formal dining area. On the one side is an arch leading to a large well equipped kitchen, and hallway to the master bedroom and en-suite bathroom. On the other side of the living area is a hallway to two further double size bedrooms and a good size family bathroom. There is plenty of storage space with fitted wardrobes in all the bedrooms, and large vanity units in the bathrooms. Patio doors in the living room and master bedroom provide lots of light and easy access to the swimming pool terrace and raised veranda. There is a built-in barbacue at the side for outdoor dining and the mature landscaped gardens around the pool make the outdoor space very private. The sea views are even more stunning from the huge roof terrace which is accessed by a spiral staircase. A perfect place to watch the sun go down!